Nose leaf variation of Rhinolophus affinis. (C, D, G) form B (R. cf. affinis) (specimen from Nghe An, northern Vietnam). Rhinolophus affinis sensu lato is distributed throughout Southeast Asia. The taxonomic status of forms attributed to the species is unclear due to the limited sample size with incomplete datasets and the taxa have high variation in morphology and echolocation call frequency. 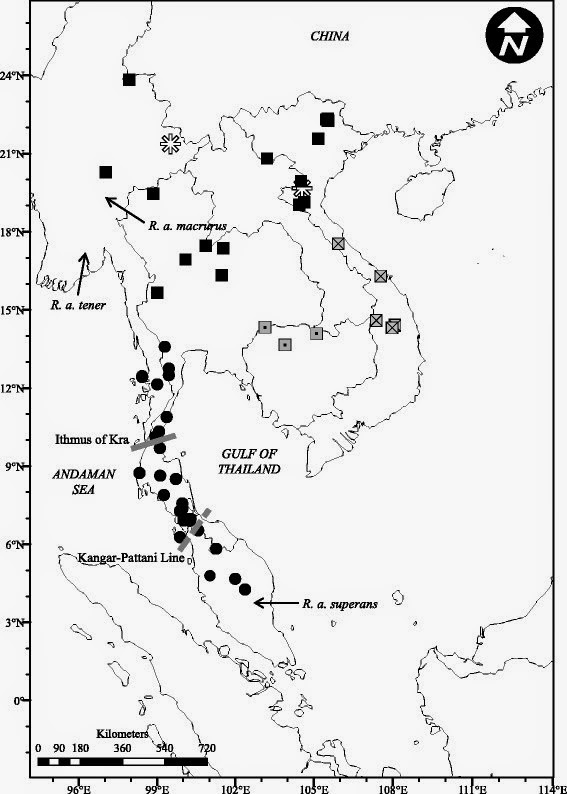 The aim of the study was to evaluate the distribution and taxonomic status of the subspecific forms of R. affinis in mainland Southeast Asia using large sample size with multiple datasets, including morphological, acoustic, and genetic data, both to elucidate taxonomic relationships and to test for congruence between these datasets. Three morphological forms were confirmed within the region; two concur with previously recognized taxa, namely R. affinis macrurus and R. affinis superans, and are strongly supported by morphological and genetic data. The third form is morphologically distinct, but its taxonomic status remains unclear. It is probable that this third form represents a distinct taxonomic entity; however, more data are required to confirm this. R. a. macrurus is known from the north of peninsular Thailand, Cambodia, Myanmar, Laos, and Vietnam (Indochinese subregion); R. a. superans is found throughout the Thai-Malay Peninsula (Sundaic subregion); whilst the third form is presently known from east central Myanmar (Shan state) and lower northern Vietnam (Nghe An Province). Our results suggest that at least three morphological forms occur in mainland Southeast Asia including one form which appears to be new to science. Echolocation call data for R. affinis are not a robust taxonomic tool as it shows a significant degree of variation which is not explained or supported by genetic and morphological findings. This study highlights significant levels of morphological variation in mainland Southeast Asia and provides an essential basis for further studies aiming to understand the population genetics, phylogeography, and taxonomy of the species. 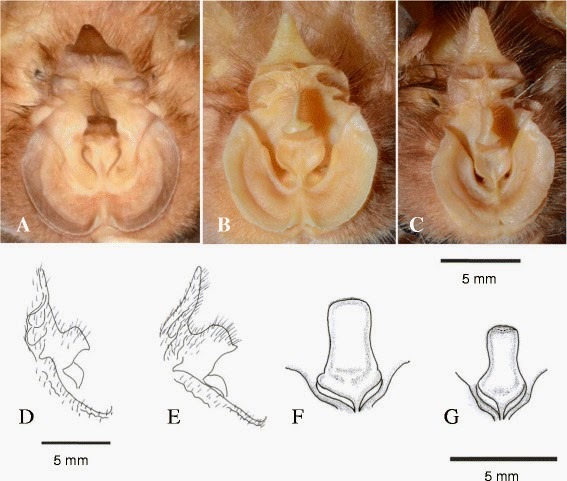 Morphological distribution of Rhinolophus affinis from mainland Southeast Asia. Circle represents morphological form from Thai-Malay Peninsula; solid square and crossed square represent morphological variation of form C; dot square represents morphological form A whereas asterisk represents the un-described form B (R. cf. affinis). The defined forms (A, B, C) are corresponded to Figure 10. Gray solid line (Ithmus of Kra) and dashed lines (Kangar-Pattani Line) are the biota transition zones proposed in the peninsular. The arrows indicate the approximate localities of subspecific forms in the research area. Saveng Ith, Sara Bumrungsri, Neil M. Furey, Paul J.J. Bates, Monwadee Wonglapsuwan, Faisal Ali Anwarali Khan, Vu Dinh Thong, Pipat Soisook, Chutamas Satasook and Nikky M. Thomas. 2015. Taxonomic Implications of Geographical Variation in Rhinolophus affinis (Chiroptera: Rhinolophidae) in mainland Southeast Asia.